(Nanowerk News) Researchers at Aalto University (Finland) and Amherst College (USA) have observed a point-like monopole in a quantum field itself for the first time. This discovery connects to important characteristics of the elusive monopole magnet. The results were just published in Science magazine ("Observation of isolated monopoles in a quantum field"). 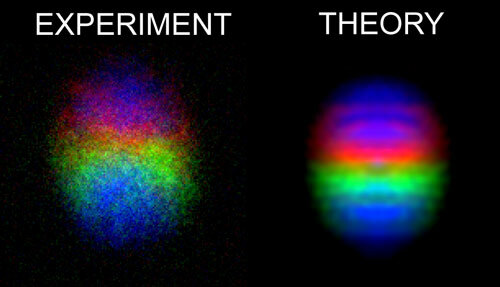 Image of an experimentally created Bose–Einstein condensate containing the monopole (left) and the corresponding theoretical prediction (right). Brighter area has higher particle density and the different colors denote the internal spin state of the atoms. The monopole is located in the center of the condensate. ‘In this nonmagnetic state, a structure was created in the field describing the gas, resembling the magnetic monopole particle as described in grand unified theories of particle physics. Previously, we have used the gas to detect a monopole within a so-called synthetic magnetic field, but there has been no monopole in the quantum field describing the gas itself. Now we have finally witnessed the quantum-mechanical monopole!’, enthuses Dr. Mikko Möttönen, Aalto University. ‘In the nonmagnetic state of the gas, no quantum whirlpools or monopoles are created in the synthetic magnetic field. However, quantum-mechanical magnetic order prevails in the sample, and we were able to manipulate this with adjustments to an externally applied magnetic field’, Möttönen continues. ‘The control of those magnetic fields must be stable to a small fraction of the size of the Earth's magnetic field’, adds Prof. David Hall, Amherst College. 'The main experimental challenge we faced is to prepare the ultracold gas under highly sensitive conditions, in which field fluctuations due to the motion of metal objects or power line variations can make observation of the monopoles difficult. ', Hall continues.